Wayne's World is an action game that was also released on the Nintendo Game Boy in 1993. As Wayne and Garth, your mission is to stop a corporate producer from taking over your cable access TV show. 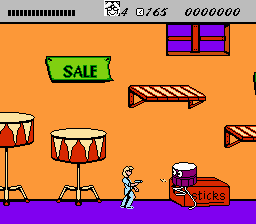 There's five stages and you'll frequently switch between characters to use their unique abilities; Garth can fire a taser gun, while Wayne has a karate kick and can perform a high flip jump. By defeating certain enemies, special P icons can be collected that temporarily give Garth a double taser blast and Wayne 20 roundhouse kicks. Although Garth's section in Stage 1 isn't too bad due to his long range attacks, Wayne's kicks feature input lag and have no effect 50% of the time; even if your foot is clearly overlapping an enemy sprite the game often refuses to register. The screen also doesn't scroll until you're 2/3's across which results in a few cheap hits. After each stage the game doesn't even have the courtesy to fill up your health metre and instead tasks you with collecting donuts from different platforms in a short level. It's a strange decision, especially considering the jump mechanics have no precision! Stage 2 focuses more heavily on platforming and it fails at every turn, while Stage 3 features dreadful screen scrolling and ninjas that fly in for some unavoidable shots. Stage 4 sees Wayne battling against flying TV sets and the dreadful collision detection starts to become a gigantic issue; there's also more precision platforming to add to the pain. In the final stage, Wayne has to climb the outside balconies to reach his apartment, but there's tons of clipping where you'll unfairly fall to your death. The game does have a couple of bosses but strategy can easily be replaced with button mashing. Wayne's World is clearly a quick, cash-in game, and in reality it's little more than a proof-of-concept demo. The poor level design shows that barely any thought was put into combining stages with the abilities of each character, and when coupled with the broken combat and platforming mechanics this is a rather unappealing game to play. Random trivia: The demo screen features a completely incompetent player and makes you wonder if THQ even had a real game tester!